The first trailer for Peter’s Jackson’s unique First World War film ‘They Shall Not Grow Old’ has been released, ahead of its World Premiere at the BFI London Film Festival in a few weeks’ time. Watch it below. Created to mark the centenary of the First World War Armistice, director Peter Jackson (The Hobbit, The Lord of the Rings) combined his own fascination with the period and his directorial skills to bring the First World War to life in a new way transforming the 100-year-old black and white footage into a colourised, high definition film. "The idea was to bring to life the people who can best tell this story - the men who were there," he says. "The film aims to give these men voices, investigate the hopes and fears of the veterans, the humility and humanity that represented a generation changed forever by a global war." The world premiere of the film takes place at the BFI London Film Festival on Tuesday, 16 October. Trafalgar Releasing will also be simultaneously screening the film in 2D and 3D to cinemas and special venues across the UK, followed by a special post screening Q&A with Jackson, hosted by film critic Mark Kermode. The film will be later broadcast on BBC One around Armistice Day. The BBC will accompany the film with a ‘making-of’ documentary with behind-the-scenes footage, interviews with Peter Jackson and an in-depth look at the creative and technical process behind the work. 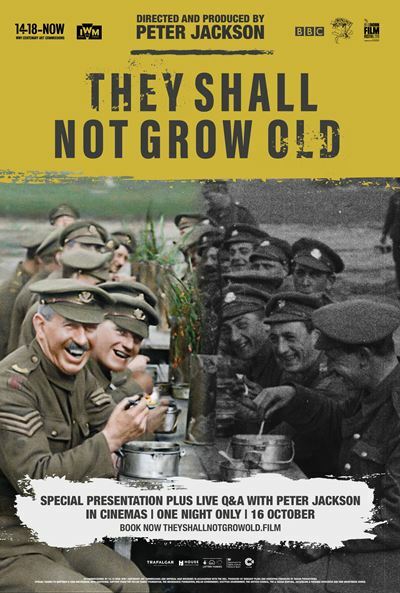 For more information and tickets, visit https://theyshallnotgrowold.film/.